Cyanovisions is a multimedia project combining video and bioart that focuses on cyanobacteria, and their entanglements with humans, our changing environment, and biotechnology. It looks deeply into life as a complex systems on micro and macro scales, climate change, and future permutations of existence on our planet. It has been shown at Intersections, Leonardo’s 50th Anniversary Celebration Exhibition, and as a solo exhibition of living and non-living artworks. 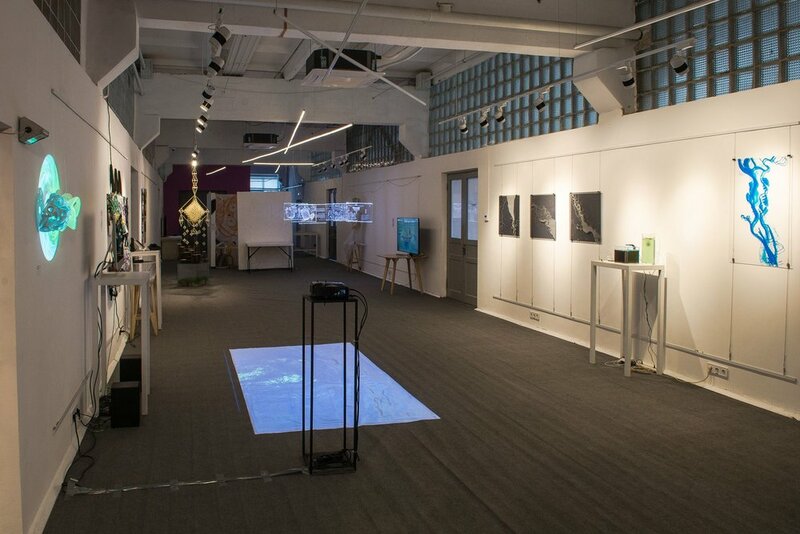 Emergent Tributaries was an exhibition and culmination of an artist fellowship with the American Arts Incubator in Kyiv, Ukraine in partnership with IZOLYATSIA. It was an international cultural exchange initiative of the U.S. Department of State’s Bureau of Educational and Cultural Affairs that is administered by ZERO1. Cyanosymbionts is a series of garments, prosthetics, and art objects for installation and short film that speculates on potential symbiosis of cyanobacteria with humans and other multi-species entanglements during this time on our changing planet. It focuses on the global environmental phenomenon of harmful algae blooms and the proliferation of cyanobacteria blooms due to human pollutants. Onion Routing AR Walking TOR was a participatory interpretation of the inner workings of onion routing and the TOR browser using augmented reality and location-based virtual markers. Geolocated models representing servers as waypoints formed a simulation of onion routing where the user represents a programmatically routed data packet. 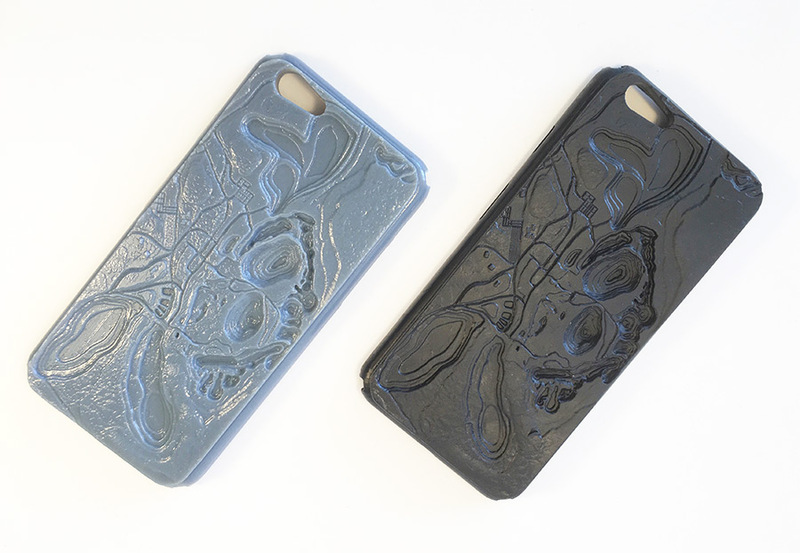 REE_minder Cases are 3D printed phone cases that use designs based on topology maps of the Bayan Obo Mining District, China, where the largest deposits of the world's Rare Earth Elements (REE) are found and sourced. Ubiquitous City is a multi-layered Internet based experience about global supply chain infrastructure told through a series of interactive scenes and puzzles, guiding you through the tentacular networks of the global marketplace and the world wide web. Made in collaboration with Donald Hanson. Infrastructure Fabrics is an ongoing exploration of imagery, textile designs and garments that translate and remix publicly shared pictures of infrastructures related to data flow, signal traffic and global networks using machine learning and texture synthesis techniques based on AI neural networks. Textile designer and seamstress for a small line of clothing with unique gif-based fabric designs created with gifSlap - a software written by Donald Hanson. These images were made into textile designs and digitally printed, a re-sourcing of internet culture into couture. Shown at Silicon Valley Fashion Week 2015 with HAH Couture. Designer + seamstress for a line of playful couture inspired by rainfall and the natural geological features it creates - rivers, waterfalls, and carved ocean cliffs. Fiume is Italian for river.